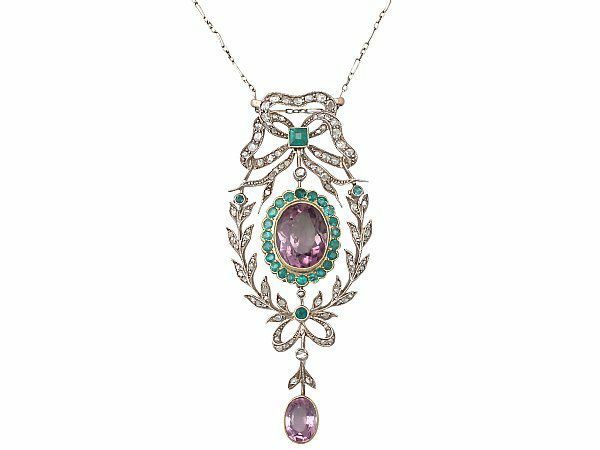 In broadest terms, Suffragette Jewellery encompases a wide range of jewellery which was either commissioned for, or worn by, supporters of the Suffragette and Suffragist movements in the early 1900s. The distinct feature of most of this jewellery was its colour scheme: Green, white and purple (or violet), which adhered to the campaign colours of the Women’s Social and Political Union (WSPU). There has, of course, been debate over the authenticity of some pieces. It has often been difficult to distinguish between genuine pieces commissioned in relation to the movement (such as the items advertised in Mappin & Webb’s 1908 Christmas catalogue, or the the specially commissioned piece presented to Emmeline Pankhurst, the leader of the movement), and items that simply happen to contain white, green and purple gemstones or enamel. The label ‘Suffragette Jewellery’ has often been attached to pieces simply to increase their value. 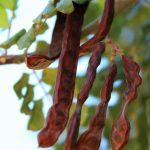 In many cases however, jewellery can be at least tentatively associated with the movement by its colours, stylistic features and age, even if there is no empirical evidence. The Suffragettes were a group of female activists who campaigned and protested for their right to vote at the beginning of the 20th Century. The group was originally born out of the Suffragist Movement which began in the 1860s and fought for the same cause but in a less radical manner. The Suffragettes’ struggles and passionate protests were key factors leading to women (over the age of 30) being granted the vote in 1918, and later, universal suffrage in 1928. The Suffragettes/WSPU were thought to have been the first campaign group to use specific colours and design styles to further their cause and create a political identity. Emmeline Pankhurst’s daughter, Sylvia, was one of the leading designers of the movement. She created the iconic Holloway Brooch (a copy of which was worn by Meryl Streep in the 2015 film Suffragette); it depicts the ‘portcullis’- a gate hanging in chains, which is the motif of the house of commons- and enamel detailing in white, green and purple. With regards to the chosen Suffragette colour scheme, one theory is that the group used Green, White and purple (Violet) because they formed an acronym for the intended political message: Give Women the Vote. 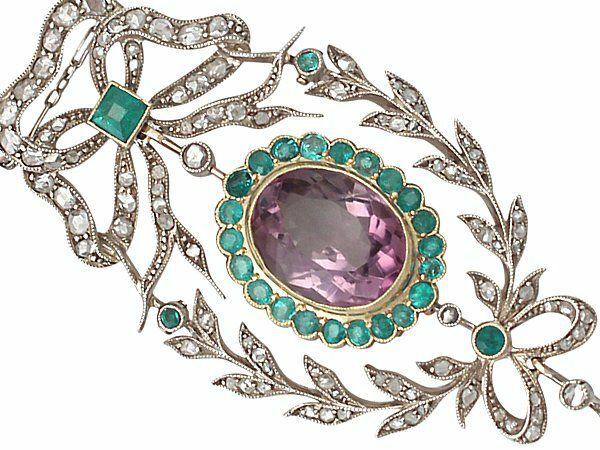 Despite these interpretations, some claim that the colours are merely coincidental, or designed to adhere to the favoured gemstones of the Edwardian period- amethysts, pearls and emeralds. 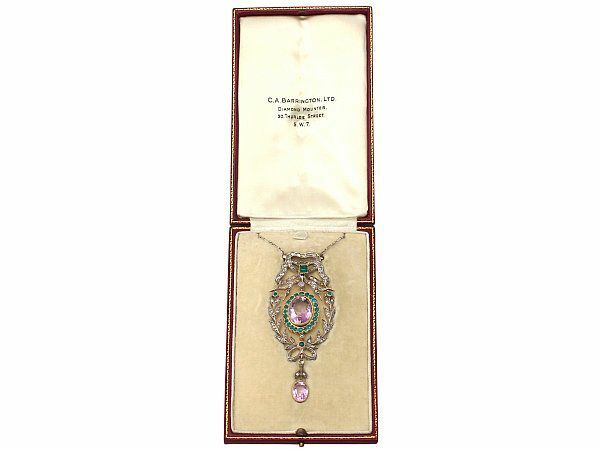 At AC Silver we currently are able to offer a wonderful pendant in the Suffragette colour scheme which, judging by the date (circa 1910) and the stylistic features, is highly likely to have been affiliated with the political movement. 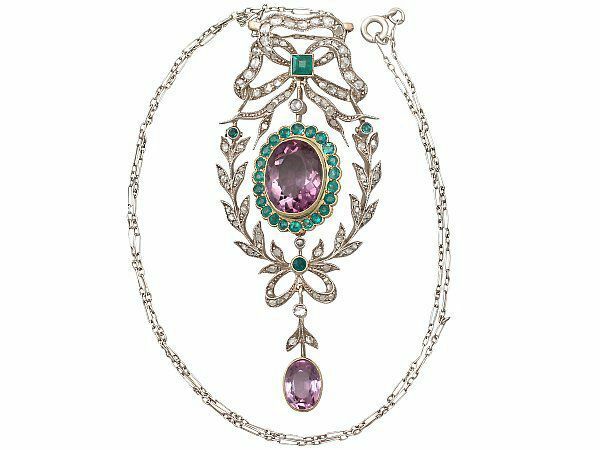 It features an abundance of stunning amethysts, emeralds and diamonds. 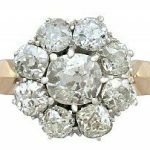 The traditional pearls have been supplanted with diamonds to represent the ‘white’ colour, symbolising purity and enhancing the item’s quality and value. Our guide wouldn’t be complete without examining the current market for Suffragette jewellery. 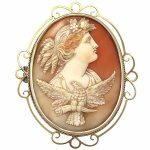 Any reputable jewellery dealer will clearly distinguish whether they are selling a piece which is genuinely an artefact from the Suffragette movement (evidencing this with its provenance), or a piece displaying the colours associated with the cause and crafted during the same time period. Some claim that sellers using the term ‘Suffragette Jewellery’ without the distinction between style and historical significance are merely trying to add false value to their jewellery. However, despite all the uncertainty surrounding the origins, Suffragette jewellery is still highly sought after. 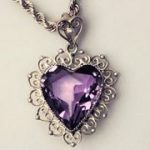 Whether this be due to the political connotations of the pieces or because jewellery enthusiasts today (like the Edwardians) are still fond of the white, green and purple colour scheme, the popularity of Suffragette jewellery prevails. 2014: The Colour of the Year Is . .
Next Entry: What is a Taperstick?